The marriage of bacon and maple. I’ve always seen bacon and maple donuts as well as bacon and maple cupcakes, but haven’t seen very much of them on a cookie. For work this week, we are hosting an event in which two chefs will be teaching a cooking demonstration as the audience learns and eats. The theme for the night is bacon and when I was asked to make a small treat to put into their gift bags, the first thing that came to mind were the marriage of bacon and maple. At first, I wanted to do a cupcake, but it would have been harder to gift wrap and put in a box as the frosting makes it more fragile. 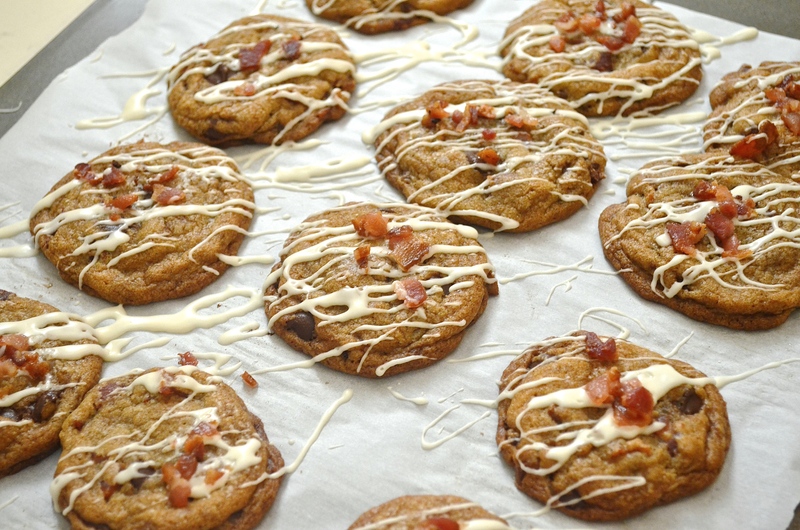 Maybe in the future I’ll come up with something bacon and cupcake related but for this, I ended up meshing the flavors of bacon and maple with my beloved chocolate chip cookie recipe that has been tried and true since I was in seventh grade. To it, I simply added chopped bacon and drizzled on a maple icing on top. While the actual taste of bacon very subtle, it adds a hint of salt and savory flavor that pairs well with the chocolate! To begin, you need bacon. 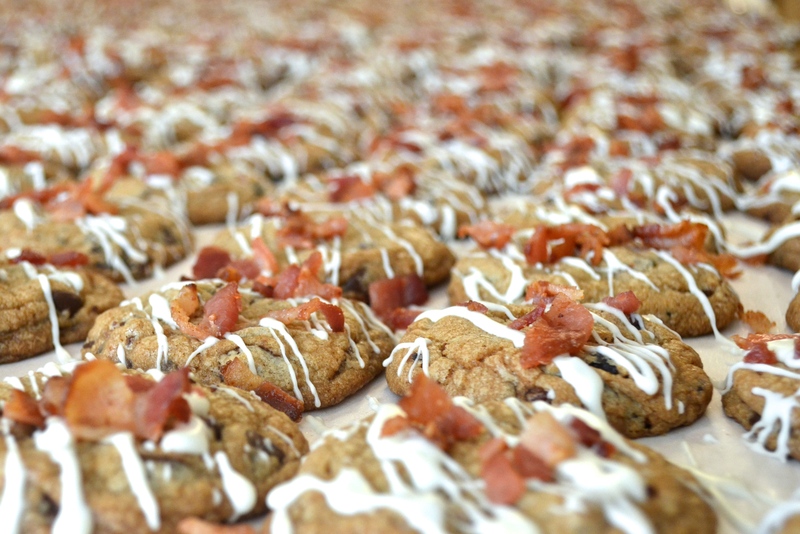 For this event, I had to make 160 cookies and ended up using 6 pounds of bacon. Yes, that is SIX POUNDS. But keep in mind that I double fried the bacon, rendering off as much of the fat as possible. So really, it came out to about 2-3 pounds that I actually used. 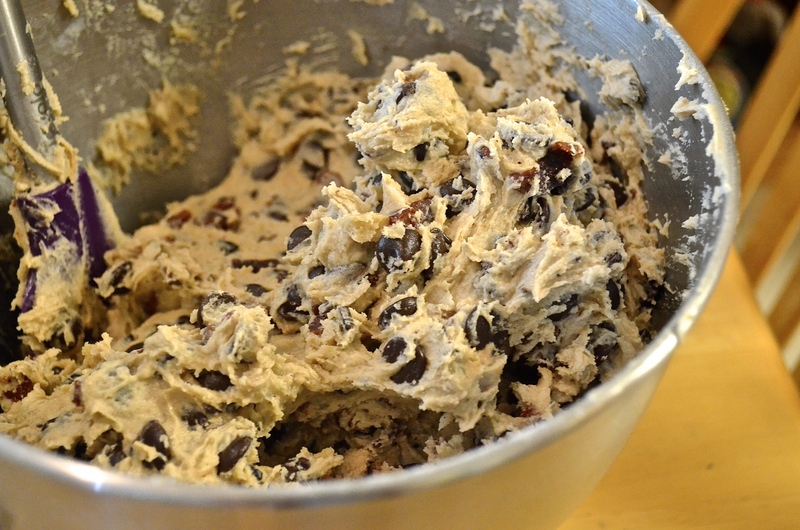 The recipe that is put below is for a standard batch of 2 dozen cookies. The above bacon is only half of what I used. Fry up the bacon until it has a beautiful golden color on both sides and remove from the heat, draining off as much of the fat as possible. Next, you want to get it into small pieces. You can use a knife to chop it up, but I find scissors are much sharper and faster at getting the job done. Now, we go back for the second fry. This removes any of the excess bacon fat…trust me, you’ll be surprised at how much fat will still come off the bacon meat! Once you think it has reached its peak and has removed as much fat as possible, place the bacon bits through a fine mesh strainer and drain out any of the extra oil. Place it in a bowl to cool down. 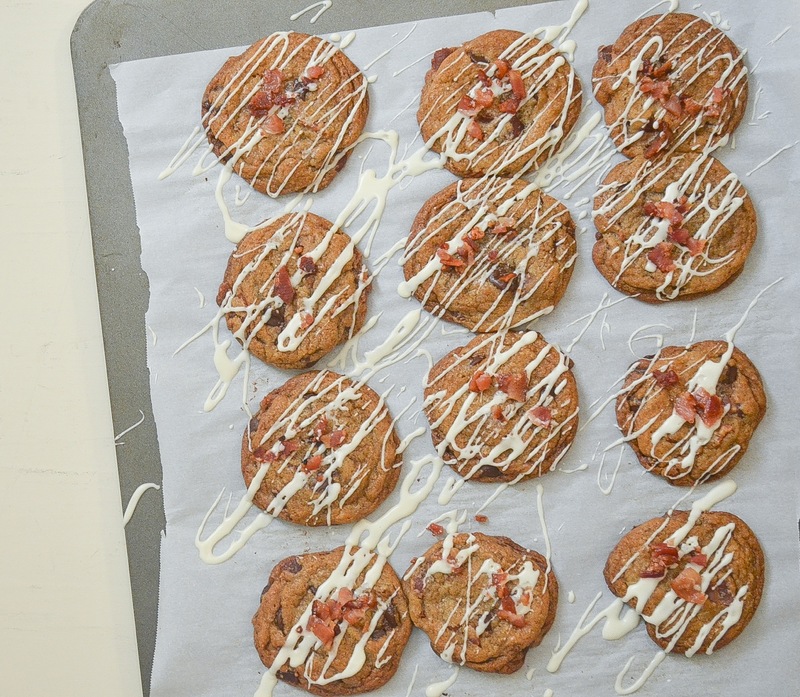 Now that you have your bacon, it’s time to make the classic chocolate chip cookies. To begin, cream together the butter and shortening. Slowly add the granulated sugar, then the brown sugar. Beat until well combined and scrape down the bowl. Next, add in the eggs, one at a time and make sure it is fully mixed in before adding in the next! It’ll start to really get nice and fluffy at this point! Then, add in the vanilla. After this stage, most recipes will have you add in the dry ingredients, but lucky for you, you have come to the right place as this recipe is not like most recipes. Add in the two bags of chocolate chips. The mixer will get a little bumpy so you might want to lock it in place. I like adding in the chocolate at this point as opposed to folding it in after as it sweetens and deepens the flavor of the actual cookie as bits of chocolate get pressed into the dough. 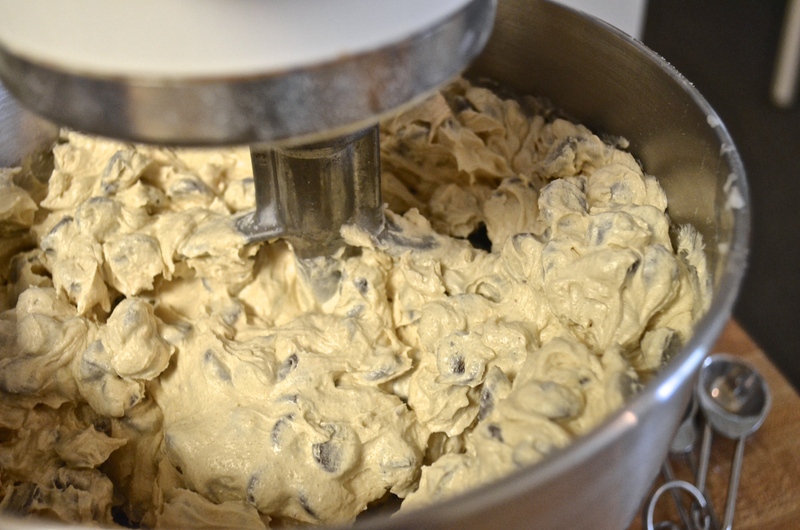 Also, adding it in now will prevent any over mixing of the batter once the flour is added in. Beautiful. Now, sift in the dry ingredients. 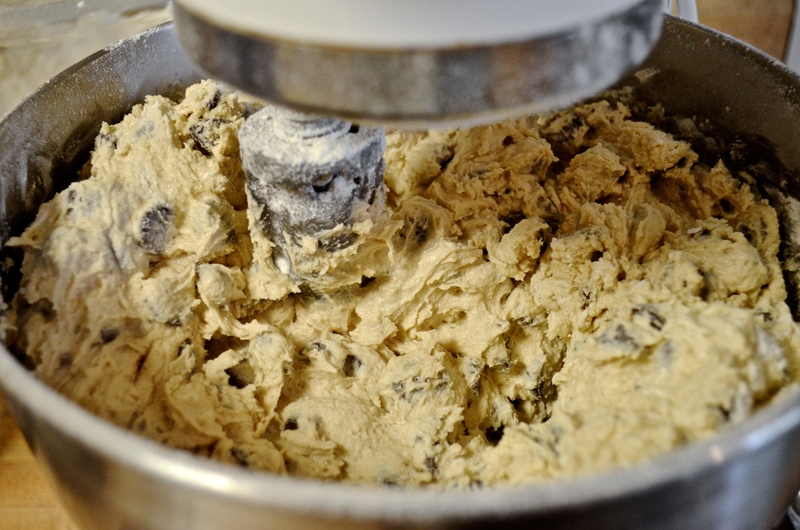 It’s very important to sift as it will allow your dough to not only be lump free, but to be light and airy. As soon as the dry ingredients have been mixed in, the dough is ready to be baconed up. 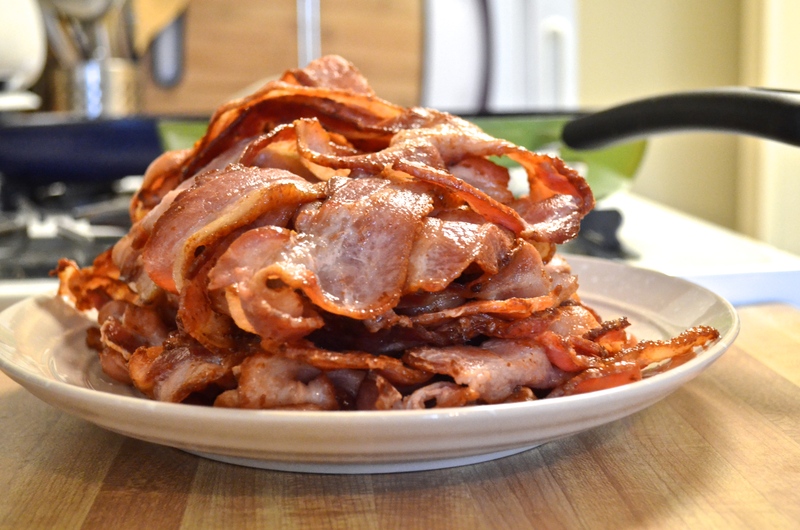 Depending on how much you love bacon, you can either add more or less. I added two cups of bacon per batch of cookies. Just remember to save some bacon to the side so you have something to garnish the cookies with! 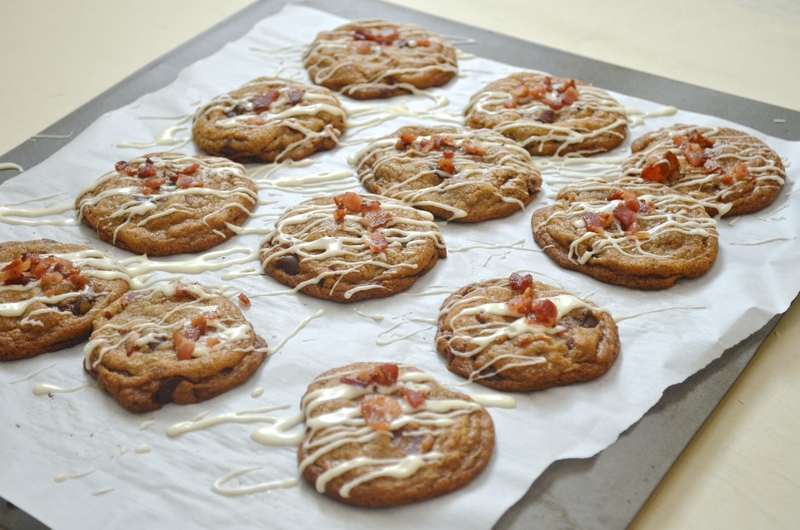 Fold the bacon into the dough and use an ice cream scoop to drop the cookie dough batter onto parchment paper. Bake at 375 for 10-12 minutes or until golden brown. Allow them to cool completely before icing them. To make the icing, simply combine the powdered sugar, maple syrup, and heavy whipping cream and whisk in a bowl until smooth and lump free. The quantities of how much whipping cream you use will vary depending on the consistency of you maple syrup. 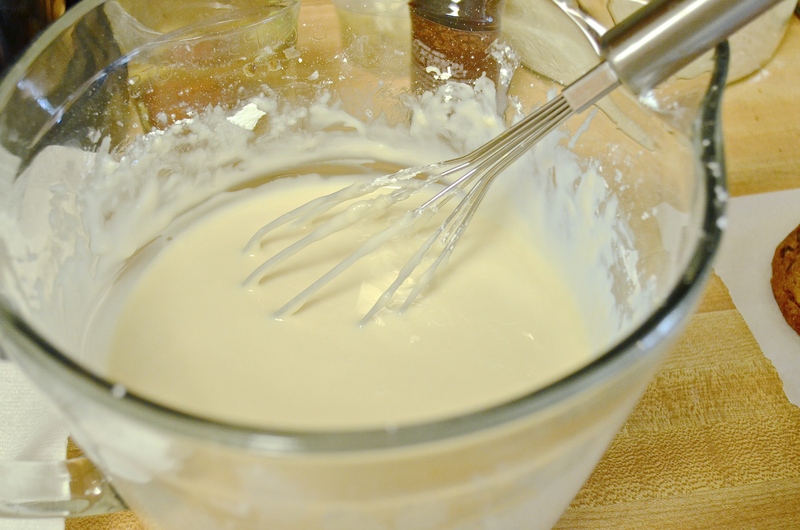 Some syrups are thicker than others, so if it is thicker, use more whipping cream. If it is a thinner consistency, use less and adjust accordingly. Use a fork and dip it into the icing and shake it back and forth on top of the cookies. This will give it a messy but chic design. Garnish the tops with bacon bits before the icing sets! 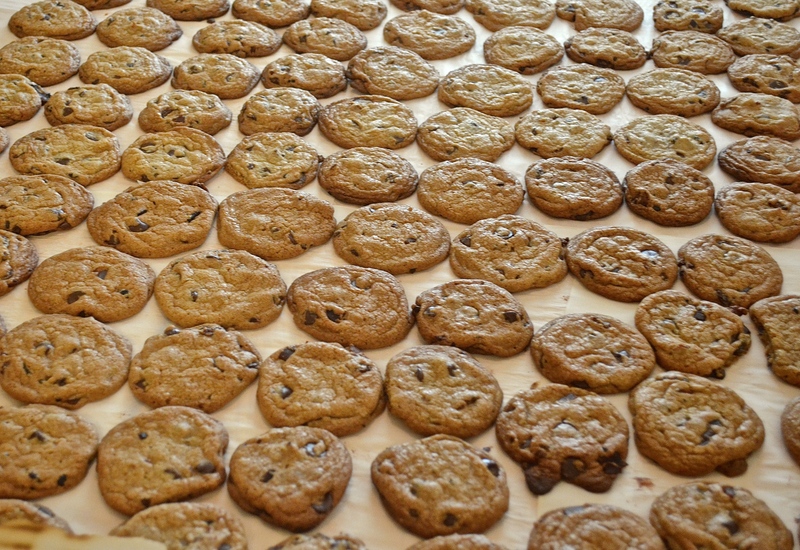 An insane amount of cookies makes me dizzy just looking at it. Remove the bacon from its packaging and fry until both sides are golden and crispy. Drain the pan from any bacon fat. 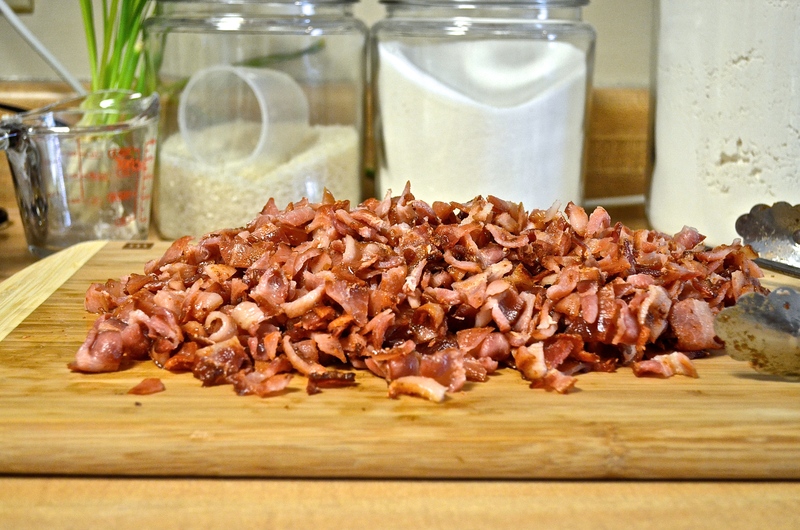 Chop the bacon up into small pieces with either scissors or a knife. Return to the skillet and fry one more time to render off any of the fat that is still existing. Once the majority of the fat has rendered off, scoop the bacon bits into a fine mesh strainer and drain the left over oil off. Transfer to a bowl and set aside. 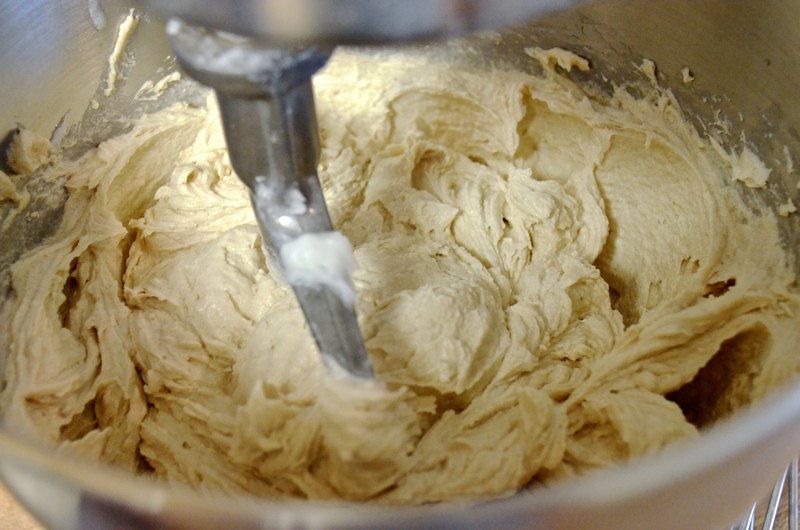 In a stand mixer, beat the butter and shortening on medium speed until fully combined. Slowly add in the granulated sugar, and beat until light and fluffy. Add in the brown sugar and continue to mix until fully incorporated. Add the molasses, eggs, and vanilla and beat until well combined. Add the chocolate chips and mix on low speed. Sift in the dry ingredients and mix until just combined. 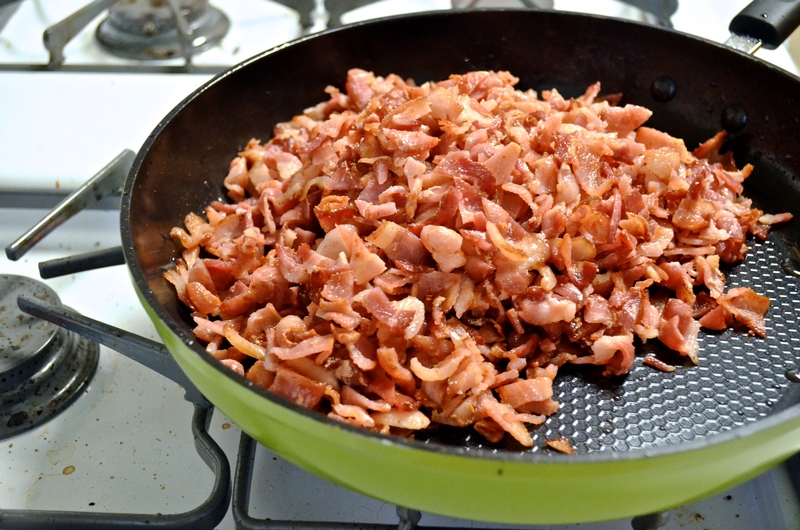 Fold in all but 1/4 cup of the bacon, saving that portion to garnish. Using an ice cream scoop, drop the cookie dough onto parchment paper or a silicon baking mat. Bake for 10-15 minutes until the cookies are golden brown and slightly browned on the edges. Allow them to completely cool before transferring to a cooling rack. In a medium bowl, whisk together the powdered sugar, syrup, and cream until it is lump free and smooth. Depending on the thickness of both the syrup and creams, you may have to adjust the recipe as you go to get the right consistency. Once the cookies have been baked and cooled, use a fork and dip it into the icing. Shake the fork back and forth across the top of the cookies, then garnish with the reserved 1/4 cup of bacon. Recipe is finally up for Yuzu brown butter bars! Love the marriage of fragrant citrus and nutty butter. Recipe link in profile!